of which depend heavily on volunteers. These groups run food pantries and shelters; rescue animals; provide activities for children; promote literacy; support libraries, museums, schools and the University; foster economic development; advocate for the environment; maintain trails; preserve historical and archeological sites; and organize community festivals, plays, concerts, lectures, field trips – to name just some of the things they do for the community. But even with the time and energy provided by volunteers, nonprofit organizations need funds to accomplish their aims. Give Grandly gives the community a chance to give back to those who add so much to the quality of life here in southwest New Mexico. and check donations, and answer questions. Computers will be set up at the fair for donors to make tax-deductible donations to their favorite projects online. There will be musical entertainment and food – lots of it – locally sourced, hearty breakfast and lunch food, coffee and tea. Community members can visit Bullard Street, enjoy the festivities, learn more about these organizations and donate, if the spirit moves. Or donate online at www. givegrandly.org. he City of Las Cruces Parks and Recreation Department was recently awarded a grant for 100 native and climate-adapted trees by the Apache Corporation Tree Grant Program. The city will offer trees to residents of Las Cruces as part of an Arbor Day giveaway to promote neighborhood beautification using native and climate-adapted trees. “Trees provide many functions that benefit residents and the environment,” said City Manager Stuart C. Ed. “Trees provide shade, which reduces cooling costs, filters air pollution, produces oxygen and food for people and animals, and sequesters carbon, which helps mitigate a warming climate, reduces runoff from rainfall, and increases property values to name a few.” This year, the annual Apache Tree Grant Program donated 50,000 trees across Texas, Louisiana, Oklahoma and New Mexico. More than 4.6 million trees have been planted with partners in 17 states since the program’s launch in 2005. 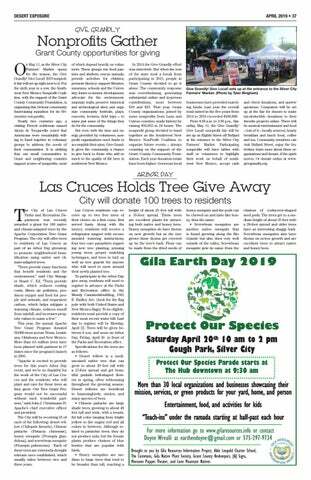 “Apache is excited to provide trees for this year’s Arbor Day event, and we’re so thankful for the work of the City of Las Cruces and the residents who will plant and care for these trees as they grow. Our Tree Grant Program would not be successful without such wonderful partners,” said John J. Christmann IV, Apache’s chief executive officer and president. The City will be receiving 25 of each of the following: desert willow (Chilopsis linearis), Chinese pistache (Pistacia chinensis), honey mesquite (Prosopis glandulosa), and screwbean mesquite (Prosopis pubescens). Each of these trees are extremely drought tolerant once established, which usually takes between two and three years. clusters of corkscrew-shaped seed pods. The trees get to a medium height of about 25 feet with a 20-foot spread and older trees have an interesting shaggy bark. Screwbean mesquites also have thorns on newer growth and are excellent trees to attract native and honey bees.